Protesters will demonstrate outside the European Commission’s London HQ on Saturday following the death of 800 migrants off the coast of Libya. They are resisting the continent’s growing anti-immigration rhetoric. Activists will protest the ‘Fortress of Europe’ which they say has led to the deaths of hundreds of migrants. The demonstration will come days after emergency meetings in Luxembourg were called to deal with the ongoing crisis of human trafficking. The meeting of high-profile ministers and diplomats was intended to be a routine conference, but was turned into a crisis meeting to respond to outrage at the surging number of migrant deaths in the Mediterranean. 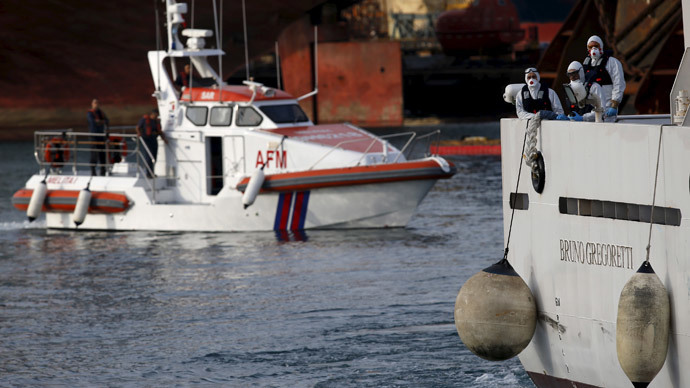 The disaster on Sunday came only a week after another migrant boat sank leaving 400 dead. Saturday’s protest has been called by the Movement Against Xenophobia and is supported by the Stop the War coalition, BARAC UK (Black Activists Rising Against Cuts) and Global Justice Now. Organizers blame figures like Sun columnist Katie Hopkins and UK Independence Party (UKIP) leader Nigel Farage for a rise in anti-immigration sentiment in Britain. “Anti-migrant rhetoric of the establishment politicians, UKIP and the Katie Hopkins obsessed media has led to thousands of people, many of whom are fleeing nations torn apart by Western intervention, drowning in the sea,” the event’s Facebook page reads. Protest organizers add that during 2014 nearly 4,000 bodies were recovered from the Mediterranean. They urge the EU to change its policy on search and rescue and resettlement of refugees. The UN High Commissioner for Refugees has also blamed the high death toll on anti-immigration rhetoric among European politicians, saying they had blocked attempts to create huge search and rescue operations across the Mediterranean. UKIP leader Farage, however, was quick to suggest that the only way to stop immigrants from attempting to make the dangerous voyage was to remove Britain from the EU to prevent immigrants abusing the principle of open borders. The captain of the boat was charged with reckless multiple homicide, and he and another man were also charged with aiding illegal immigration, on Tuesday. The pair was among 27 survivors who arrived in Italy on Sunday.